After many long Sunday club runs with the Otley CC, (see: traditional British club run) it was time to graduate to a more race oriented club. Arriving at Oxford University was an exciting time; as a Fresher you are confronted with an unending range of social and extra-curricular choices. I dabbled in everything from student politics to amateur dramatics (or were they the same thing?). But, cycling was my main interest. In the first year, I spent quite a lot of time riding into the Oxfordshire countryside (mostly on my own) it was a welcome break from lectures and the insular world of an Oxford college. I got pretty fit in those days, though for some reason didn’t do much racing. On the way out to the time trial, I felt a bit of an outsider, but after beating a guy on a time trial bike I felt like a proper rider now! 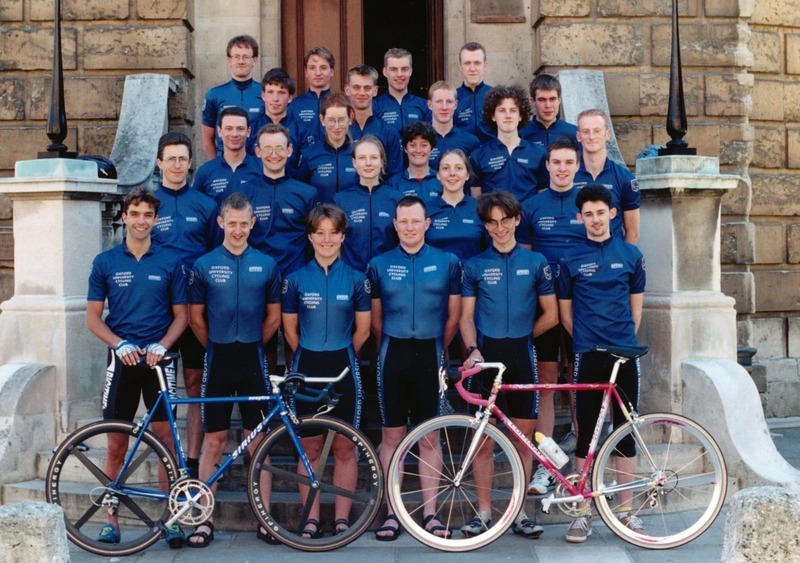 OUCC team photo from 1998. Click to enlarge – spot the two hill climbers – clue look for the hair. Italian elegance, I didn’t have. There was a good social scene with the OUCC – we would often meet at Magdalen College bar, which was a great place to meet. The backbone of the club seemed to be primarily the ‘eternal’ physics post-graduates. Riders like Tom James, who seemed to have been around since alpaca tights and time trials with dead-turns. It meant club runs were pretty well organised going through a maze of Oxfordshire lanes, usually to places like Cirencester and Stow on the World. I was probably half expecting club runs to be the same as Otley. But, they were faster and only one tea shop stop, as opposed to the positively heady tea drinking of Yorkshire. Oxford University CC was definitely a bit faster moving than the more sedate world of the traditional British club run. One good rider, David Ryan was known to push the pace on Sunday club runs to be able to be back in time for his rowing training on a Sunday afternoon. Despite being quite fit, it never really occurred to enter races. I thought you might as well wait until your are ‘better’ But, the club was keen on entering the student team time trial and of course the Varsity 25 in May. This was something to aim for, and we started our Wednesday morning team time trial training, 9am sharp. This was great fun, 3 hours – 60 miles at a decent pace around the flatter roads towards Thame. I was in the ‘B’ team. The ‘A’ team was quite strong. Despite training through the winter, I got injured or something a week before the big event, so in the end didn’t go and race. It was a similar experience in May, I was supposed to race the Varsity 25 mile TT, but some injury prevented me racing. To compensate, I did get to stand on a roundabout near Kingston Bagpuize and marshall the event we were promoting. I have quite vivid memories of marshalling on this roundabout for some reason. Whenever I race on the A420, I usually think of the time I was standing on that roundabout. The Varsity was a bit of a downer in those days, despite having a super hill climb team, this young tester called Michael Hutchinson had an irritating habit of turning up and putting 5 minutes into everyone else. I think it meant Oxford had a real draught and several years passed with Cambridge dominating the Varsity 25 mile time trial. 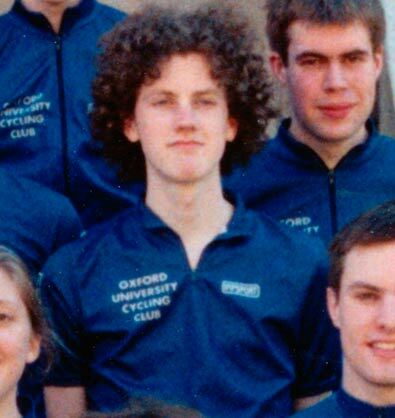 But, if Oxford University Cycling Club wasn’t dominant on the flat, we did have a pretty decent hill climb team. In 1996, Jim Henderson came third in the National hill climb championship. In 1997, Jim went one better and finished 2nd behind Stuart Dangerfield. Jim in 1998 after winning national title. 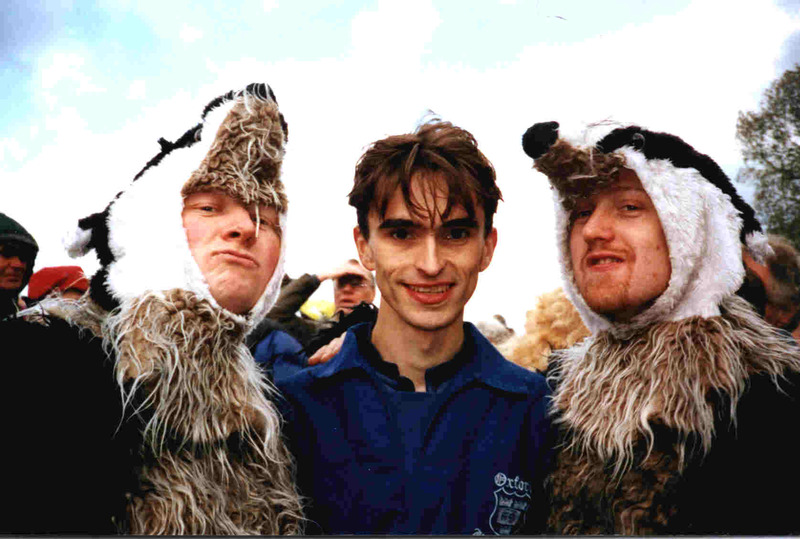 – With OUCC support crew dressed as badgers. I think that is on Nick Pashely left. In 1998, Jim, riding for Oxford University Cycling Club, won the National hill climb for the first time on Dover’s Hill (Jim’s blog). OUCC won quite a few medals around this time, with Brenda Allen and Jim Henderson picking up quite a few BUSA titles. My biggest contribution to OUCC, apart from standing on that Kingston Bagpuize roundabout, was probably being Treasurer in 1998. It meant I was on the ‘committee’ for a year, under the wonderfully quixotic ‘leadership’ of Nick Pashley. Nick had a great sense of humour and seemed to have a great joie d’vivre. I don’t think he will mind, if I say I don’t remember him as being a natural climber, but he had a good capacity to keep spirits high. If things had turned out differently, I might have started a racing career aged 18. Who knows how that would have turned out? It would have been fun to be part of the OUCC hill climb team in the late 1990s. But, as it was, I never did a hill climb, and only about one open 10 mile Time trial in my four years at Oxford. As fate would have it, my cycling seemed to slip away, and by my third year I had drifted away from the sport and OUCC. Other things were going on, such is the ways of the world. But, the first two years, were a good experience; it was a good club to be part of. As it turned out, I wouldn’t start racing until 10 years after my first cuppers 10 mile TT in Stadhampton, when I was 28. By that time, even the eternal physics phD students had moved on. I had lost touch with everyone. The first time I thought of OUCC was when I started doing 10 mile TT, and I often ended up racing close to Brian James (father of Tom James). I also met a few former OUCC riders when taking part in my (one and only sportive so far) the Cotswold Challenge in memory of Dave Ryan, the popular OUCC rider tragically killed in a road accident. I started doing the hill climb season, just as Jim Henderson’s hill climb career was coming to an end. Jim beat me quite a few times, but towards the end, I managed to get the better of Jim on a few of the longer climbs. Though I never raced against Jim when he was at his peak – winning the national hill climb form. I remember at one hill climb at Otle,y Jim and Lou came in a really small car; they had 3 or 4 kids on the back seat and about 2 bikes and turbo in the boot! I don’t have any room, when it’s just me and my bike! It was like Doctor Who’s Tardis. But, in a way, it meant that as Jim retired after the 2009 national, there was still an OUCC old boy keeping the tradition of Oxford hill climb going. I was really chuffed Jim and his family came up to the 2013 hill climb championships on the Stang. See: Cycling Weekly photo I was a pleasantly surprised as bringing a young family of four children to a wet and windy climb in the middle of nowhere is quite a dedication to the sport. Jim later said, the night before, he was questioning his sanity in driving all the way. But, as it turned out, he was really happy and glad he came, especially to see an OUCC old boy and amateur hill climb specialist get the title. I think our riders would love to meet you and ask you many questions about your training, past and future success. I would love to arrange something in few months, will you be willing to come along to inspire a bunch of young motivated lads? No one will do it better than a local star!